The small town of Liestal situated about 17 kilometres to the south-east of Basel has 13,700 residents and is the main town of the canton of Basel-Region in the north-west region of Switzerland and as such, is the headquarters of the cantonal authorities, courts and administrative authorities. The total area of Liestal measures 18 square kilometres and the River Ergolz flows through this town from the south-east to the north. 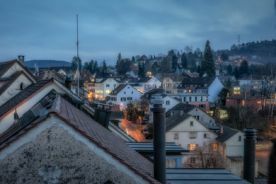 The old Arsenal, the Dichter- und Stadtmuseum and the Harmonium museum are among the most popular tourist attractions in Liestal. The so-called Törli, the “Obere Tor” (or upper town gate) of the partly retained defences that guarded the southern approach to Liestal is a landmark of the town. With regards to customs, it is worth mentioning the Liestal Fasnacht, also called “Lieschtler Fasnacht”, which is the carnival celebrated throughout the year and follows the example of the carnival celebrated in Basel. Three hospitals in Liestal ensure that medical treatment is provided to everyone in Liestal: the Canton Hospital Liestal having a total of 384 beds and 1240 staff members, the Cantonal psychiatric hospital Liestal with about 190 beds and 400 staff members and the Ergotz Hospital with 16 beds and 13 staff members. Every year about 16,500 patients receive treatment in these hospitals. A total of 650 doctors, 144 dentists and 430 physiotherapists in the canton Basel-Land ensure medical care to a total of 275,000 residents of the canton.